and organisations who care, to young people disadvantaged through no fault of their own. We aim to transform lives, buffering the long-term effects of adverse experiences. Working with our young people, their parents and carers, schools and BREAKTHROUGH mentors and coordinators, our carefully selected, trained and matched volunteers, will each commit to meet 1:1 with a young person weekly in school, to listen and build a relationship that will offer vital counsel and insight. Let’s raise expectations for our young people. Let’s support them to achieve their potential in educational attainment and to explore possibilities for positive destinations post school in further and higher education and work. Let’s help develop their employability and move towards a positive, self-sufficient future. Providing in school support to young people and their mentors. Secondary school based mentoring programme for care experienced and other vulnerable groups. Opportunities for young people to explore ideas about their future, through work experience and other work related activities. BREAKTHROUGH is funded by the Northwood Charitable Trust and supported by DC Thomson and Dundee City Council. BREAKTHROUGH have been inspired by MCR Pathways, a Glasgow charity who have developed over 10 years, a model of mentoring support that is impacting positively on hundreds of young people. 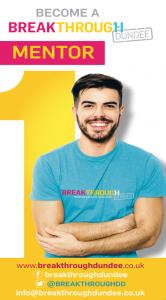 Want to join the BREAKTHROUGH Team? Breakthrough Dundee © 2019. All Rights Reserved.